Former Assembly Speaker Sheldon Silver was convicted Friday on federal corruption charges in his retrial, the same verdict that he received three years ago. Silver, a Democrat from lower Manhattan, remains free on bail. He will be sentenced July 13. The retrial, which began April 30, was largely a repeat of Silver’s 2015 trial except the jury took about a day to render a verdict. The seven women and five men deliberated for about eight hours, mostly on Friday. In 2015, the verdict came on the third day of deliberations. After his earlier conviction, Silver was sentenced to 12 years in prison before the verdict was reversed in 2017 because of a decision by the U.S. Supreme Court involving a former Virginia governor. The high court decision changed the definition of the crimes that Silver had originally been charged with. An appeals court ordered the retrial. Bharara also charged then-State Senate Majority Leader Dean Skelos (R-Rockville Centre) with corruption. Skelos’ retrial is scheduled to start next month in Manhattan federal court. The retrial included testimony from 26 witnesses for the prosecution and cross examination of them by Silver’s attorneys. Silver chose not to testify. 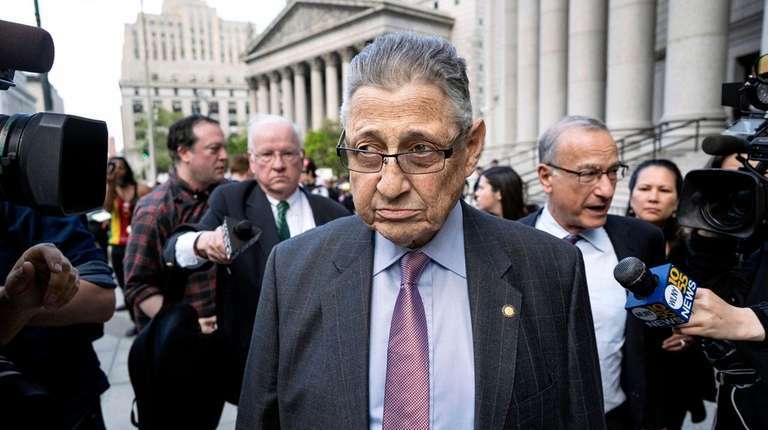 The prosecution alleged that Silver used his position as an Albany power broker to extort nearly $4 million in bribes in return for steering state funds and legislation to the people and businesses that were enriching him via payments from two law firms in Manhattan. Silver then allegedly invested the money, reaping an additional $1 million. Silver was convicted on seven counts of honest-services mail fraud, honest-services wire fraud, extortion under color of official right and money laundering. Three years ago, in his first trial, Silver also was convicted on seven counts. In the retrial and the first trial, the prosecution alleged that Silver orchestrated two quid pro quo schemes. The first involved cancer patients being referred by the legislator to the Weitz & Luxenberg personal injury law firm. Manhattan-based Weitz & Luxenberg paid Silver more than $3 million in referral fees from legal settlements and verdicts won on behalf of 48 patients suffering from mesothelioma, a cancer caused by exposure to asbestos, according to the federal indictment. Silver received names and contact information for people diagnosed with mesothelioma from Dr. Robert Taub, a then-Columbia University physician. Taub in turn received $500,000 in state research grants, allegedly at Silver’s direction. Silver also helped Taub’s son and daughter secure jobs and steered a state grant to a charity started by Taub’s wife, the indictment states. Silver was “of counsel” to Weitz & Luxenberg, earning a salary of $120,000 per year, but did little work there, according to the prosecution. He lost the job after being indicted. The second quid pro quo scheme involved Silver improperly receiving $700,000 in referral fees from a tax law firm, Goldberg & Iryami in Manhattan, for steering cases to the firm from two developers, who were seeking Silver’s support for legislation before the Assembly, the indictment states. The developers wanted Silver — who ruled the Assembly with an iron grip — to extend a state law giving tax breaks to developers of apartment buildings that include affordable units alongside luxury units. They also wanted to limit any expansion of rent control in New York City, according to the indictment. The retrial was ordered by the Second U.S. Circuit Court of Appeals when it granted Silver’s appeal request in 2017. The appeals court said U.S. District Judge Valerie E. Caproni’s instructions to jurors in 2015 did not comply with the U.S. Supreme Court decision that narrowed the acts required to convict public officials in a quid pro quo bribery scheme to formal exercises of government power, not just meetings or telephone calls. The Silver retrial is the second of four corruption trials involving state government to take place this year. Besides the Skelos retrial, onetime SUNY physicist and nanotechnology kingpin Alain Kaloyeros will face jurors next month. Longtime Cuomo aide Joseph Percoco was convicted in March of conspiracy to commit honest-services wire fraud and solicitation of more than $300,000. As word of Silver’s conviction spread Friday evening, there were renewed calls for tougher ethics laws.